On June 16, 2017, the love of my life, my rock, my 51 year old husband had a ruptured aneurysm, and as a result, a stroke. I am telling the story because there are lessons to be learned, that I am learning, that I think will help people. Here, I tell what happened, and then later, I’ll walk through some of the huge takeaways from this whole journey. Maybe you are the one it will help. For his backstory, you can take a listen to the podcast here. For the audio version of some of this story you can listen to our bedside chat episode from the hospital here. But in the meantime, Tony is a high school English teacher; the best kind. One who really likes the students he teaches. He advises the juggling and the hacky sack club at his school, (both of which he strongly encouraged into being). He goes in early and stays late, (unless I need him to come take the kids to karate or something). He spends weeknights and weekends working on grading and planning and gives up a good portion of his winter and spring breaks to the same. He is beloved by his students and was voted Teacher of the Year in two different capacities in the last four years. And he has reluctantly served as department chair for two years in the past, and done it well. He is an amazing husband and father, who, even though he doesn’t always do the right thing with his kids or with me, he is always trying. When he screws it up (as we all do sometimes! ), he is open to finding and admitting his own culpability, even if it takes a day or two. On that fateful day, this young(ish) vibrant and busy guy, woke me up in the middle of the night to have me call 911. I sat up, still waking up, figuring out what in the world was happening, and trying to remember if my phone was close, and asked him if he wanted me to call 911. I still feel the surge of adrenaline that coursed through me, constricting my chest, making me hyperaware, and bringing my mind to a spin, as I found my phone, turned on the bedside lamp, and dialed those three numbers. The clock said 2:46am. Those are the words burned into my brain. I don’t recall all of the questions, but while I was answering, Tony was leaned up against the headboard, with sweat pouring off his forehead, his cheeks and down the back of his neck. He was breathing heavily, clearly in tremendous pain. At one point, he leaned over and kind of collapsed his head into my lap. Did you know you could get repeat surges of adrenaline? I remember hanging up the phone, looking at him lying there, thinking it might be better if he was upright. I looked around the room. Did you know that you can also be incredibly vain in moments of crisis? How much of the clean laundry piles can I hide before the EMTs get here? Oh man, when did that pile of books get there? Can I shove them under the bed? Is the path even clear enough for them to get to the bed? He is not in an easy position. I should clean up my nightstand. How will they get him out of here? Oh crud, we have all the kids stuff in boxes in the living room path. How is he breathing? How did my room get to be so messy? I can’t leave him to clean up. Notice that there was not even one thought about going to the hospital or any of that. What is THAT about? I opened the front door to make sure the EMTs could get in and Tony walked out the door and headed for the fire truck that had just pulled up. As I tripped over one of the boxes of kid stuff piled in the living room, I accidentally woke my daughter who was sleeping on the couch. So, I told her to get my parents, who thankfully were visiting at the time. I was able to not worry about the kids as this took place and that was a huge relief. After some discussion and some basic testing with the firefighters, they made the clear decision that he needed to head into the hospital, though they thought it had more to do with his heart, (which I also suspected). There are all these split second decisions that have to be made when something like this happens. What do I bring? (That one is actually a million tiny decisions at once.) Do I need more clothes, does he? Do I need to bring things to do? My phone. Does he need his phone? His wallet? Does he need shoes? Do I need shoes? Do I need a sweater? It is supposed to be 100 degrees today. (Hint: Yes. Hospitals are COLD!) Chargers? What else, what else? Do I ride in the ambulance with him? I was grateful that one of the firemen recommended I drive to the hospital to meet him. He said, “You don’t want to be stuck there when this is over.” It gave me more time to find shoes and grab my work bag with all my chargers and computer. What is next? No idea. No way to predict this kind of thing. Fortunately for both of us, our town is small and the hospital is both easy to find and not very busy. The ER had very few people in it when we arrived: me shortly after the ambulance. They got to us right away and did all the normal things that they do in the ER. He got a blood pressure monitor, an ECG (did you know those are portable now?! ), and a CT scan, though the ER doc was very flippant about how his headache was probably just caused by the high blood pressure. 180/120 is very high and very abnormal for Tony. Someone mentioned later that it is possible that the blood pressure could have been that high due to the pain levels too. We just don’t know. Because they were pretty slow that morning, the CT scan came back pretty quickly via the ER doc. He was a little more serious to deliver the bad news. He went on to explain that they didn’t have the facilities at that hospital to deal with this kind of neurology and told us we were being transferred to their sister hospital, 40 minutes away. Now, we are in Southern California, so I immediately thought of some of the big name hospitals we have down here that must have great neurology departments: Cedar-Sinai, UCLA Medical… Were either of those the ones we were going to? We were being transferred to a hospital I had never heard of, for a problem I couldn’t quite wrap my head around. I mean, he was lucid. He was in pain, but he was moving, breathing, talking, not slurring…what does blood in the brain even mean?! 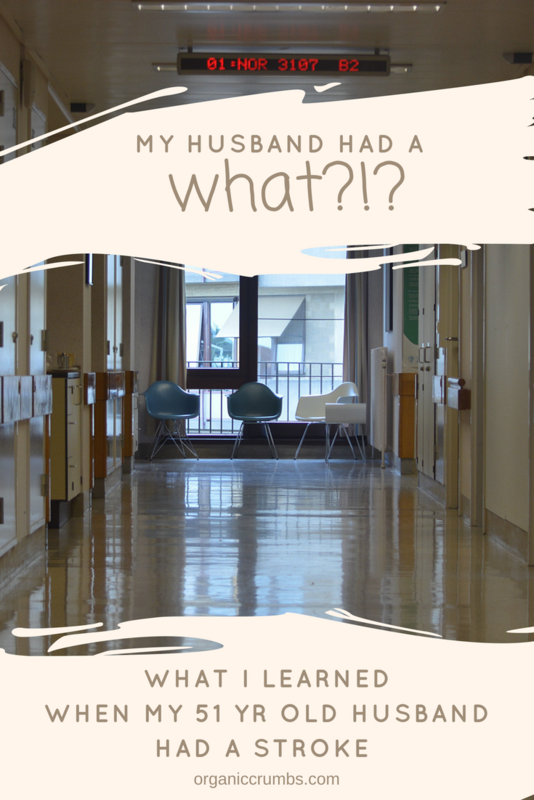 When the doctor left to arrange transfer, I asked the nurse what she knew about this other hospital and why we weren’t going to one of the bigger ones. She was very careful not to tell me anything about his condition or about our options. She told me that if it was her people, she would go with the transfer and address any other options when we get there. There, where they have the equipment and skill to deal with…whatever this was…just in case. In what felt like hardly any time at all, the ambulance was there to take him to the other hospital. All I had was an address and where to go when I got there. It wasn’t like I was going to be able to actually follow the ambulance. I saw him loaded up. He smiled at me and flashed the “I Love You” hand sign that we have used since I taught it to him 20 years ago. I didn’t kiss him goodbye. My first breakdown, of two, happened when I sat in the car and entered the address into my phone’s GPS. I had a realization that the little wave and smile could actually be the last time I see my husband alive. I called my mom, and woke her up, to tell her what was going on, and to ask her to put together some food and a sweater to send with a friend who worked near the hospital. While I was talking to her, my oldest sister called. I was able to talk to her for the whole drive to the new hospital. It helped. But I was still alone. My second breakdown occurred after I had found the right place, but realized I couldn’t get in to see Tony. Someone told me to sit in the waiting room and the surgeon would come out to talk to me. I waited for only about 20 minutes or so. I remember finding a place to plug in my phone and sitting down nearby. I remember thinking how strange it was that I was there, that it didn’t feel real. I remember walking through all the possible scenarios of how this would end, still not knowing what it meant to have blood in the brain. I remember wondering what I would tell the kids if I had to come home without their daddy. I remember thinking that this waiting room wasn’t as cold as the ER. The surgeon came out to tell me that they were going to do surgery, that there were no options at this point, that he had a ruptured aneurysm bleeding into his brain and that they were going to try the most non-invasive way first, up through the femoral artery in his groin, but if it didn’t work, they were going to go into his brain from the outside. He was already prepped for surgery. It should take around 2 hours, give or take. He would see me after to let me know how it went. And then he left me alone. At this point, I had enough information to do a little research. I knew aneurysms were not good news. This is what I found first. Then, our good friend, Jim showed up with food and my sweater. He is no stranger to tragedy and was just the right mix of understanding and humor to get me through waiting for the surgery to be over. When the surgeon came out to tell us that it had gone well, that the aneurysm was taken care of with a procedure called coiling (which I totally looked up later! ), that his condition was called a subarachnoid hemorrhage, (which I didn’t remember until I had heard it at least 3 times), and that I would be able to see Tony in about a half hour after they woke him up and sent him upstairs, Jim felt like he could leave me and get to work. His optimism didn’t shield me from the underlying facts that the doctor gave us. The risk was still great and we were in it for the long haul. Our favorite un-cite-able source gave me this. I headed upstairs to what I realized was the ICU and the lady at the front desk told me that they didn’t have the patient yet and I would have to wait outside. I didn’t know where the waiting room was, so I found a chair near the elevators. By this time, my texts were getting responses, and my local friends were jumping into action. My friend Amy showed up almost as soon as I sat down in the hallway. She contacted all of the foodie friends we have in the area, and they eventually showed up with Paleo snacks, cold brewed coffee, organic non-dairy creamers, Rebbl and organic protein drinks, Chipotle and even some sustainable wine, (which I don’t recommend in stress). I felt surrounded with care. By 11am, they still hadn’t let me in to see Tony. This time though, they said they had him, but no one was allowed in to see him yet. Finally, nearly 3 hours after his surgery finished, I was allowed to go back to see him. He had his own nurse, and he was sedated. It was explained that he had been unsettled and confused when he was brought out of the anesthesia and was thrashing a bit. Since they had gone into his brain through his femoral artery, the site of entry had to be kept as still as possible to decrease the risk of bleeding to death. Thrashing was not going to help. So they gave him a good dose of something to knock him out. And it knocked him out good. Did I mention that he has never used any drugs, recreationally or otherwise? He doesn’t drink AT ALL. He barely even takes ibuprofen for anything, maybe once or twice a year?! How do you think he is going to respond to the normal level of pharmaceuticals that are getting pumped into his system? More on this in another post. He had a ventricular catheter stapled to his head, draining the excess fluid regularly and measuring his intracranial pressure (ICP) once an hour. Every time he moved, the drain receptacle had to be leveled to the middle of his ear. Over the next 10 days, I would learn more about leveling a “brain drain” than I would ever need to know. It was also around this time that I learned that his hemorrhage was also considered a stroke, and that we would be testing his neurological signs and symptoms multiple times a day for as long as it took. Did he know his name, his age? Did he know what month it was, what day, what year? Could he touch his finger to his nose and then to the finger of the person asking? Could he lift his arms, his legs? Did he know who I was, my name? Did he know where he was? One nurse asked him what his girlfriend’s name was. Without hesitation, he said, “Tami”. I guess this would have been the time to learn anything hidden! Good thing he is loyal and sweet. From then until we left the hospital 12 days later, we had multiple learning experiences. I am a different person than I was when I called 911 that early morning and I know Tony will never quite be the same, though he is expected to make a full recovery. We learned patience, lots about hospitals and drugs, more about the care of nurses, when to be/have an advocate, how to be a naturally minded person in an unnatural environment, when to fight and when to release control, and so much more. I will be addressing some of these lessons in upcoming posts. Until then, hug the ones you love; do not discount sudden pain, even if your tendency is to push through it; and take every day as the great gift that it truly is.